Brownsville Police Chief Orlando Rodriguez speaks to the media Thursday, Dec. 7, 2017 along with District Attorney Luis V. Saenz during a press conference to announce a grand jury has no-billed two Brownsville police officers who shot and killed a man in early October while serving a warrant. A Cameron County grand jury has no-billed two Brownsville police officers who shot and killed a man in early October while serving a warrant. Cameron County District Attorney Luis V. Saenz released body-cam footage of the shooting, which The Brownsville Herald requested, on the Brownsville Police Department’s Facebook page early this afternoon. On Oct. 5, at 10:57 a.m., Detective Lorenzo Rosales and Officer Jaime Ortega fired six shots at 31-year-old German Ornelas at 55 W. St. Charles after he raised a seven- to eight-inch fillet knife over his head in an attack position, Saenz said. 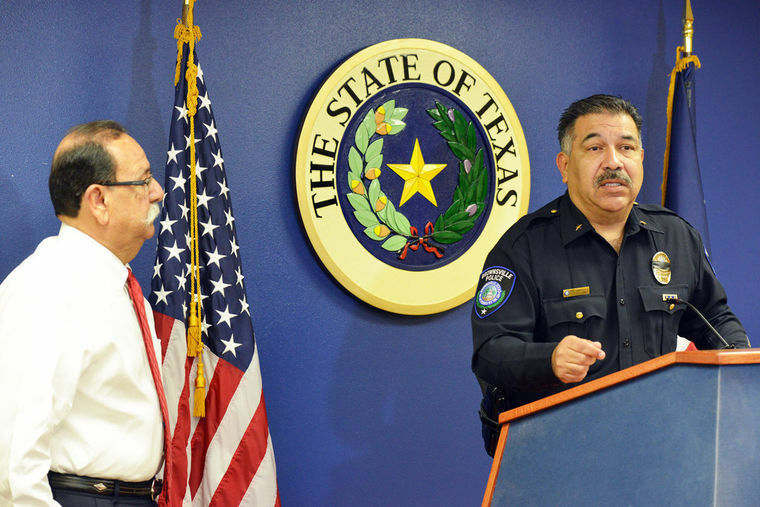 Saenz said the body-cam footage, which wasn’t shown to media during a press conference, will show that Ornelas was asleep when officers entered the apartment and that he woke up with the knife already in his hand and refused repeated orders to put it down. Ornelas was hit by bullets twice. Police were executing an arrest warrant for Ornelas, who has an extensive criminal history, for burglary of a habitation, Saenz said. Saenz also said Ornelas made comments, which he says will be heard on the video, that he was not going back to jail. However, Ornelas’ aunt, Maria Celia Hernandez, previously said that Ornelas did not have a knife and that police tried to persuade the family to say that he did.